After your arrival at the New Jalpaigudi railway station or Bagdogra airport, you will get an assisted on-road transfer to Lachen, situated at an altitude of 9,800 feet. En-route, you are going to halt at On the way stop for sightseeing at Kabi Lungstok, Tsahi Viewpoint, Naga Waterfalls, and the meeting point of Lachen Chu and Lachung Chu at Chungthang. Enjoy sumptuous lunch at Namok. In the evening, arrive at Lachen. This town is surrounded by the snow-clad majestic Himalayan ranges. Enjoy the peace that is spread around you. Stay overnight. 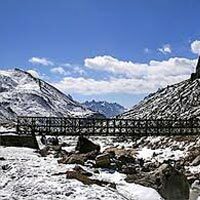 Post breakfast, proceed to go to Chopta Valley (13,200 feet), once you arrive at Thangu valley at 13,000 feet, you are going to have an amazing view of Thangu Chu, Chopta Chu and Lassur Chu. In the summer and spring season, the valley is filled with beautiful colorful flowers such as Rhododendrons, Primulae, Alpine and more. In winters, the valley witnesses heavy snow. Enjoy the unspoilt beauty of the place. Return to Lachen, for lunch. Post lunch, continue to Lachung. En-route, stop at the mesmerizing Twin Waterfalls and Bhim Nala Waterfalls. Late evening arrival in Lachung. Check-in at your hotel for an overnight stay. Post breakfast, leave for a visit to Yumthang valley (11,800 feet ). En-route, you will come across a number of hot springs. Popular as ‘Valley of Flowers’, the valley is filled with beautiful colorful flowers of Alpine, Rhododendrons, Primulae etc. In the winter season, the valley is covered with a sheet of snow. Back to Lachung to have lunch. Later, visit the Lachung Monastery-built in 1880 on the confluence of rivers Lachen and Lachung. Later explore the Cottage Industry and the waterfalls, scattered all around. Dinner and overnight in Lachung. After having breakfast at your hotel, you will go for a day-trip to Mirik Lake via Nepal Border. IHPL will take care of all the paperwork necessary at this stage. Enjoy boat ride or horse ride here. Do the activities of your interest. Admire the surrounding natural beauty. Overnight stay in Darjeeling. Have your breakfast and leave for Gangtok. 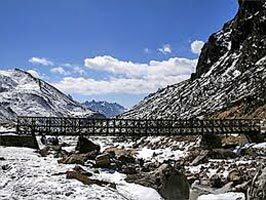 En-route, you are going to halt between Singhik and Mangan from where you are going to have an excellent view of the Khangchendzonga Range, which will include Mt. Pandim, Mt. Kabru, Mt. Simvo, Mt. Jopuno, Mt. Khangchendzonga and Mt. Siniolchu. Take lunch at Namok. The next visit is Phodong Monastery, a monastery constructed during the 18th century, which is home to around 250 monks at present. Get transferred to the New Jalpaigudi railway station or Bagdogra airportfor your onward journey.